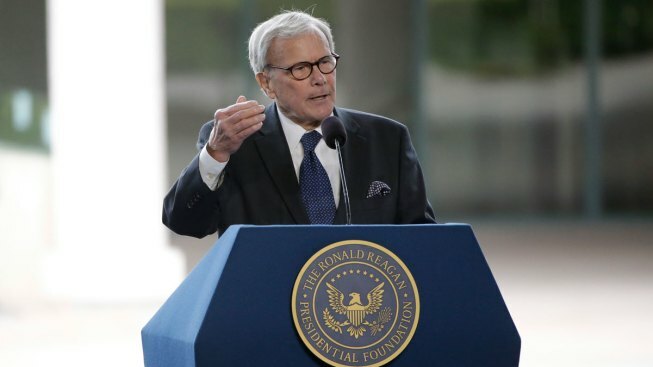 Tom Brokaw speaks during the funeral service for former First Lady Nancy Reagan at the Ronald Reagan Presidential Library Friday, March 11, 2016, in Simi Valley, Calif. Longtime NBC journalist Tom Brokaw has given the University of Iowa thousands of documents spanning his career, and they're now available to the public. The collection includes a notebook with interview questions for Soviet Union leader Mikhail Gorbachev and press badges from Saudi Arabia and the 1992 Republican National Convention. A daily planner holds handwritten notes such as "call Bill Gates." Some of the donated photos show Brokaw standing in front of plumes of smoke in New York on Sept. 11. A baby-blue book has a copy of transcripts from President Richard Nixon's famous White House Tapes. Brokaw said it's stained from reading transcripts while eating fried chicken made by his longtime wife. "This (collection) really does represent his career, his life and personal life as a whole," said Greg Prickman, head of special collections at the university's Main Library. The former "NBC Nightly News" anchor donated the items to the school in 2016 and it's been organized and archived by special collections over the past year. The collection was made available to the public on Thursday, the Iowa City Press-Citizen reported . "One of the wonderful things about Tom Brokaw is his ability to tell other people's stories and also his ability to tell his own story through his writing and his memoirs," said Prickman. "Now, with his collection, he's allowing other people to start coming in and tell stories using the materials he's collected throughout his career." "We're very fortunate with this collection because Brokaw is still so active, has a great memory and is willing to tell us these stories," Riordan said.